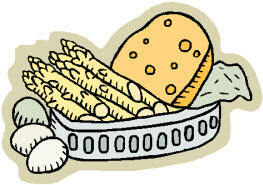 Cook asparagus pieces in large pot of boiling water until crisp and tender, about 2 minutes. Rinse asparagus with cold water: drain and set aside. Place crumbled gorgonzola cheese and whipping cream in medium saucepan. Cook over medium low heat until cheese melts and mixture is almost smooth, about 4 minutes. Meanwhile, cook pasta in large pot of boiling salted water until tender, but still firm to bite, stirring pasta occasionally. Drain well and return pasta to pot. Add cheese sauce to pasta: toss to coat. Mix in asparagus. Drizzle lemon juice over. Season to taste with salt & pepper. Serve, passing parmesan cheese separately, if desired.